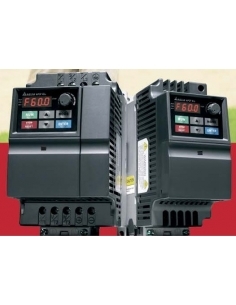 Variable frequency drive for ac motors, static frequency converters, 1-phase VFD driver. Single-phase frequency converter 230V 0.2Kw (0.25CV), 230V three-phase output, RFI filter and integrated programming panel. The single-phase frequency converters allow the control and speed variation of three-phase standard motors to run from a single-phase supply network. Manufacturer: DELTA. Reference: VFD002L21B. Single-phase frequency converter 230V 0.4Kw (0.5CV), 230V three-phase output, RFI filter and integrated programming panel. The monophasic frequency converters allow the control and speed variation of standard three-phase motors from a single-phase supply network. Manufacturer: DELTA. Reference: VFD004L21B. Single-phase frequency converter 230V 0.75Kw (1CV), three-phase 230V output, RFI filter and integrated programming panel. The monophasic frequency converters allow the control and speed variation of standard three-phase motors from a single-phase supply network. Manufacturer: DELTA. Reference: VFD007L21B.